Run XenCenter and connect to your XenServer(s). 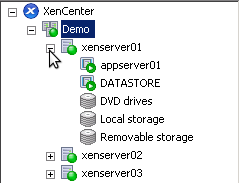 Expand the nodes of the servers in XenCenter until you locate the virtual machine that you would like to connect to. Click on the name of the virtual machine that you wish to use. Now choose the Console tab to see the display of the virtual machine. Rather than press CTRL+ALT+DELETE on your keyboard, click the button that says "Send CTRL+ALT+DELETE (CTRL+ALT+INSERT)" underneath the console display. You should now have a logon screen. Use the Scale checkbox to enable / disable scaling of the window console. It is probably best to maximise the XenCenter window to give the console window more space. 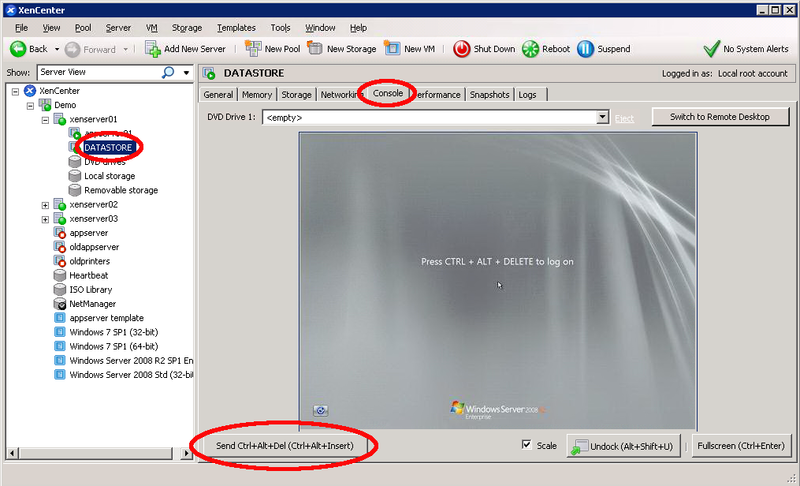 When logging into a Server 2008 / Vista or newer virtual machine, remember to prefix the administrators username with the domain name and a backslash - otherwise you will log on with the local administrator account.